wall26 - Black Grunge Metal Plate Texture - Canvas Art Wall Decor - 100"x144"
I put this up by myself. Looks awesome. Easy to handle , great price and quality ! I recomend if you want something cool and different . It takes a little time to paste it you will enjoy it when the works get done. Every time someone walks in they are amazed at how it looks! It makes my home pop! Definitely, would purchase again. Oh I forgot, I just did. Worth the price looks good in my children's room. Very nice mural. Bought for my daughters room. I did put in textured wall and it has held up just fine. Love this mural. So happy with the quality and size. 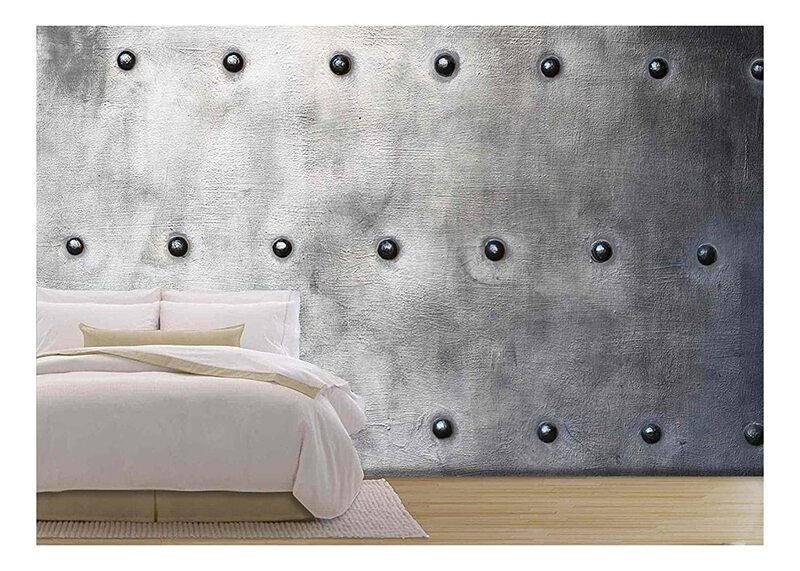 I'm using it add a headboard for a cal king, looks great. Pretty easy to hang, measure twice hang once. I drew lines with my level and measured the overlap each time, they were all slightly different. Honestly, looks incredible. I love the way it looks on my wall. I did put it up by myself and it was a little difficult (I'm short w/short arms) but it went up and looks great. There is a little issue with it not lining up perfectly, but if you aren't looking for the imperfections you won't find them! Worth the price to make such a statement on my wall! I really liked this product. At first it was hard finding the adhesive and I had a little trouble putting it up, but once it was up it looked beautiful! Although noticeable as being a picture due to some of the outside trim being slightly dented (might be my fault as we hung with 3M poster hangers rather than directly onto our wall for removability), the graphic itself is fantastic. Wanting to fill a bare space high up on our wall over our entryway half bath, which was too dangerous to hang a regular picture due to a possible falling hazard, now has a wow factor. My husband and I like it so much that we have ordered a second, although, different scene for another high area in this same entry area space. Well, worth the money if you have a bare space that cannot take a regular picture or are in a office space with no windows. Highly recommend.